It’s that time again. Well, frankly any day is “that time”. 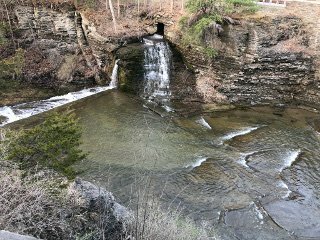 Since I live just a few miles from Taughannock Falls State Park, it’s one of my favorite places to visit. It’s not the only reason to come to the Finger Lakes, just one of the finest ones. There’s so much majesty and inspiration here. It’s time to show you more photos of my favorite waterfall. The gorge walls around the Falls and stream are incredible. 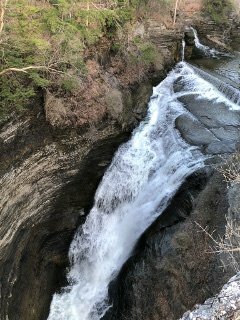 From above, it’s easy to see the power of water and how it has carved the deep ravine that holds these streams and waterfalls. From below, the majesty of the tall rocks takes my breath away each time I visit. Visitors can learn more about the geological and historical facts about these formations using a mobile app or the information markers along paths. There is also a visitor center that’s very helpful next to the overlook for the Falls. 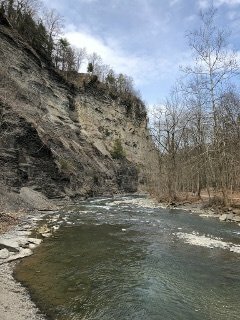 There are many sights to see near Taughannock Falls. 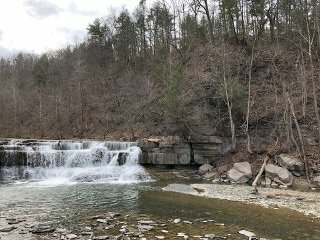 There are many waterfalls in the state park. The segment above the main falls is known as Upper or Lucifer Falls. This has some terrific view from the road, parking lot, and rim trails (especially the bridge between the South Rim and North Rim trails). Below the main falls is the Lower Falls. 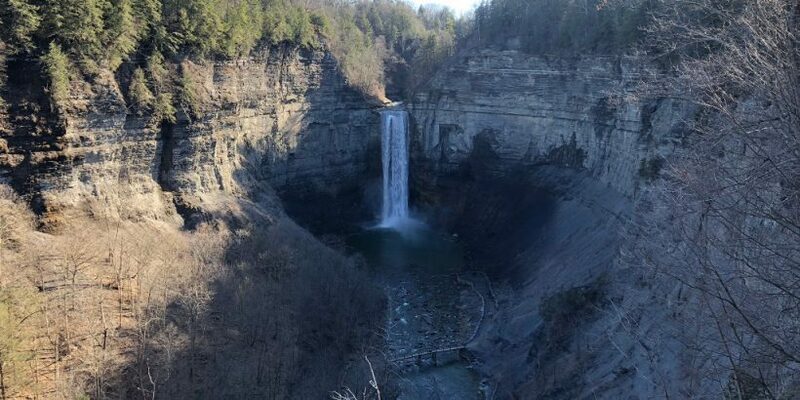 A few tourists mistake this as the actual Taughannock Falls. However beautiful, these clearly don’t have the same majesty as the main waterfall. The main falls can be seen from several vantage points. Some of the main ones are the overlook, the rim trail(s), and the gorge trail. 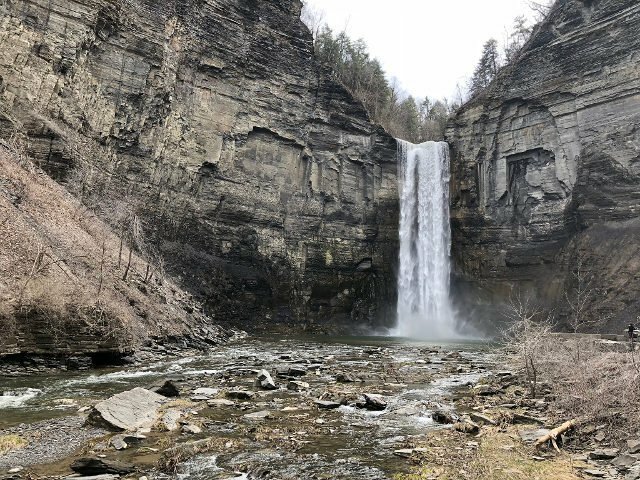 Taughannock Falls is incredibly inspiring. Experience its majesty. The Rim Trail (both North and South) are great trails. Local runners who go for trail running appreciate these trails and are frequently seen on them. 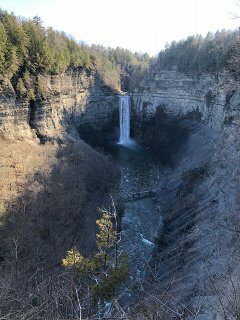 From the North Rim Trail, you’ll find one of my favorite upper viewpoints for the main Taughannock Falls. I get inspired every time I visit the park. So many views, waterfalls, rock formations, forests, visitors, and many others provide inspiration. As one example of the varieties of inspiration, I recently saw a group of people setting up for a marriage proposal at the overlook. 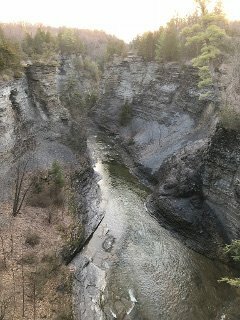 If you can, walk the gorge trail. 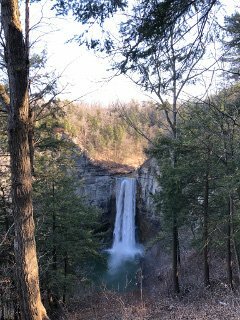 However beautiful the waterfall is from the overlook and the rim, its majesty is most powerful from the foot of the falls. If you didn’t get enough of the falls here, check out more by clicking on this sentence. That is some serious majesty! It’s lovely and important for artists to be able to live in places where they can drink in beauty and inspiration. It sure does help. I hope you’re getting your share of beauty and inspiration, Brenna! I am! I am fortunate to live in a beautiful part of the world. But that waterfall is something else! I can’t argue with you on either point.